CRICKET: Kaushal Lokuarachchi who will celebrate his 26th birthday on May 20, became the second Peterite to win the coveted Observer Schoolboy Cricketer of the Year Award in 2001 for his fine performances in the inter-school cricket 2000-2001. Rohan Buultjens, the stylish batsman won the prestigious award in 1981 - the first Peterite to win the top award. 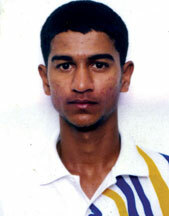 Kaushal Lokuarachchi - Observer Schoolboy Cricketer of 2001 fancies the one-day game. Lokuarachchi, in addition to winning the main award, was also picked as the Best Bowler and he was known as Sri Lanka’s new spin discovery. Allrounder Lokuarachchi has been a leading figure in the St. Peters College cricket team and no doubt has helped the Peterites in a big way in becoming the Best All-Island Team. He scored 530 runs in 2001 (with four half centuries) in the few matches that he was able to play for St. Peter’s and also had a haul of 75 wickets. His talent as a cricketer was spotted by the authorities early and he captained the under-13, under-15 and under-17 teams and was coloursman and vice captain of the first eleven Peterite team in 2001. A right-arm leg-spinner, he had 75 wickets in the 2001 inter-school season. He was able to play in only 12 out of 20 matches for St. Peter’s as he was called up to do duty for the national under-19 team on tours to England and Australia. He was a member of the under-19 Mini World Cup Team in 2000. He was also a member of the national squad for Test series against England. Lokuarachchi has played for major teams after his school career. Bloomfield Cricket and Athletic Club, Sinhalese Sports Club, Wayamba in the Premier League Cricket Tournaments and Twenty-20 tourneys with great deal of success. He had number of successes at St. Peter’s and it was quite natural that he was picked for the coveted honour of Observer Schoolboy Cricketer of the Year in 2001 and that opened up a good future for him in club cricket. Having made an exceptional start in his career as an all-rounder as a schoolboy, Lokuarachchi was made part of the Sri Lanka squad after the disastrous 2003 cricket World Cup. He is primarily a leg-spinner and it was thought that he would be able to capture a regular place in the team. However, having met with a car accident in August 2003, he was handed a four-month disciplinary ban by the Sri Lankan Cricket Board. Having made a return to the game in the 2004 Provincial Tournament he made his way back into the team. He was somewhat of a god send as Muttiah Muralitharan suffered a shoulder injury. So, Lokuarachchi captured a place in the team for the one-day series against South Africa in the Champions Trophy. Lokuarachchi, a promising allround cricketer broke into international cricket early in 2003 when he made his debut in Sharjah and a few weeks later, he made his Test debut against Stephen Fleming’s New Zealanders. He later toured the West Indies. He made a peach debut when he plucked a one-day international wicket with his first ball in international cricket against Kenya in Sharjah in April 2003 but he is mindful of the fact that dismissing batsmen is a difficult task. Former Sri Lanka leg-spinner D.S. de Silva was one of the experts who fine-tuned Lokuarachchi for a couple of years. He has greatly benefitted from De Silva’s guidance in his bowling. Lokuarachchi’s best performance for the country was when he played for Sri Lanka ‘A’ on the England tour in 2007. His splendid ‘double’ enabled Sri Lanka ‘A’ to beat the formidable Yorkshire team, in the one-day game played at Headingly. Yorkshire scored 239 for 8 wickets in their allotted 50 overs with Lokuarachchi completing his 10 overs claiming for 53. Sri Lanka ‘A’, chasing victory target of 240, Lokuarachchi played the anchor role to hit a blistering 64-ball, 77 runs to guide Sri Lanka ‘A’ team to achieve a creditable victory. Lokuarachchi is somewhat unfortunate in the fact that he belongs to an era where there are two other right-arm leg-spinners who are also vying for a birth in the national team. The presence of Upul Chandana and Malinga Bandara meant that ‘Loku’, as he is affectionality known to teammates, has no fixed place in the national team which also has the inimitable off-spinner Muttiah Muralitharan. It seems that ‘Loku’ has somewhat decided that his best chance to play in the national team is in the shorter version of the game. He says he loves to play one-day cricket and his style of bowling and batting is most suited to it. It is difficult to play one-day cricket than Test cricket, because of the intensity is greater in the one-day game. ‘I love the challenge’ Loku said. He believes as a leg-spinner he has a lot to learn, but admires gaining experience each time he plays for his country. He is also a useful batsman lower down the order with two first-class centuries and a batting average of 27. Lokuarachchi had an outstanding career at St. Peter’s College where he won the Best Bowler’s prize and was also picked Schoolboy Cricketer of the Year. ‘Loku’ then joined Bloomfield in 1999 and represented them till last season. He changed clubs and went to SSC where he took 14 wickets in the Premier League semi-final against Colts CC and followed it up with a century which is the best performance of his career so far. Lokuarachchi has benefited a great deal from attending Sri Lanka Spin Academy by former Sri Lanka off spinner Ruwan Kalpage and from coaching received from Sri Lanka ‘A’ team coach Chandika Hathurusingha. His last Test for Sri Lanka was against Australia in Kandy, March 16 to 20, in 2007 and his last one-day international; Sri Lanka vs England on 13 October 2007 in Colombo. Lokuarachchi has played 4 Tests, scored 94 runs, top score of 26 not out average 23.50. He bowled 594 balls, claimed 5 wickets at an average of 59.00 and held one catch. Played 21 one-day Internationals scored 210 runs best being 69 batting average 14.00. Bowled 1,011 balls and captured 31 wickets at an average of 23.38, best bowling 4 for 44 and held 5 catches.